When you wake up in Spain – you have to call that a “Good Morning”! The beginning of our day went as well as you can imagine if you have ever flown to Europe from the US; a high carb, low taste breakfast; a good cup of coffee that wasn’t exactly hot; a long walk through the terminal to get to customs; and a long wait in a short line at the car rental booth. With that behind us we climbed into a sweet little Fiat 500 (later to be dubbed “Snowball” and headed north to Burgos, a two-hour drive. Driving is Spain is a pleasure. The roads are good and the scenery is every changing. Our trip north from the Madrid airport was a pleasure for both reasons. Certainly, the scenery is the best part! So much change in so little area – it was like watching a movie – allowing it to unfold and enchant us as we watched from the windows. One surprise was driving through a wine region. The vines were obviously old: They were thick and gnarly. They were also not yet in leaf so they created a strange sight: There were also no wires, yet, to support the branches and fruit – just lots of gnarly little trunks coming up from the ground in very organized and distinct rows. The larger patchwork pattern of rows of different vineyards was also distinguishable. There was a sense of expectation permeating the landscaping. Papamoscas or The Flycatcher. 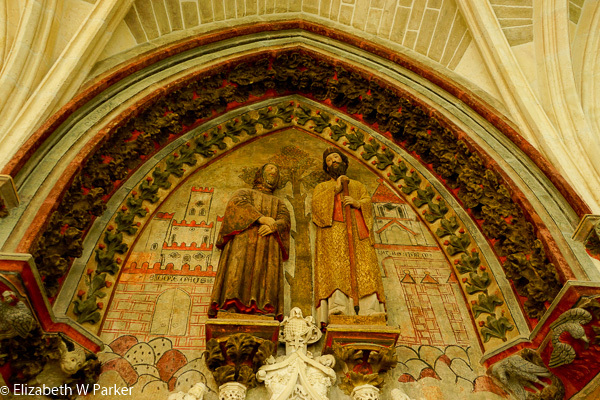 A curious carved wood sculpture in the Burgos Cathedral who opens his mouth when the hours are struck. Ribera del Duero is actually the name of two different things. 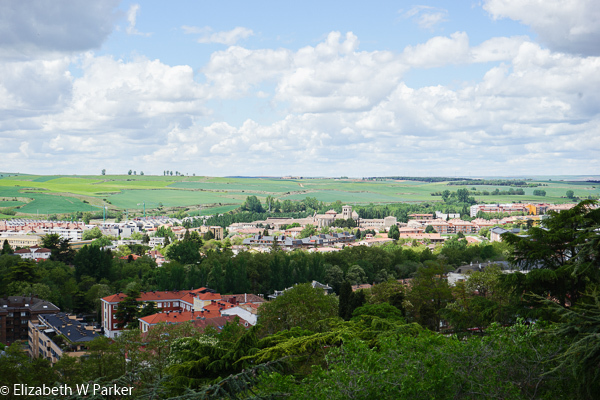 It is the name of a wine growing region, as I mentioned above, but it is also the name of a geographic region in the province of Burgos, in southern Castille and Leon. The comarca is wholly within the wine growing area, but the wine growing area also covers parts of the provinces of Valladolid, Segovia and Soria. In honor of our passing through this region we had a very good Emilio Moro Ribera del Duero (tempranillo) with dinner at our hotel. Our hotel, the Hotel Landa, was conveniently located right off the highway just a few kilometers outside of the city of Burgos. What a gem! The main building of the hotel is located in a 14th century stone tower. Though none of the interior is original to the tower, the decoration is amazing. You would be hard pressed to guess that it is all a fantasy inside. It feels real and looks real – except of course for 21st century comforts. Our room was also amazing. It was a lovely suite on the fourth floor, and from the windows we could see the cathedral of Burgos – not such a stretch considering it is the third largest cathedral in Spain! We arrived at the hotel about 11 in the morning, and thankfully, our room was ready for us. We were in desperate need of nice long nap – and we took one! Three blissful hours. 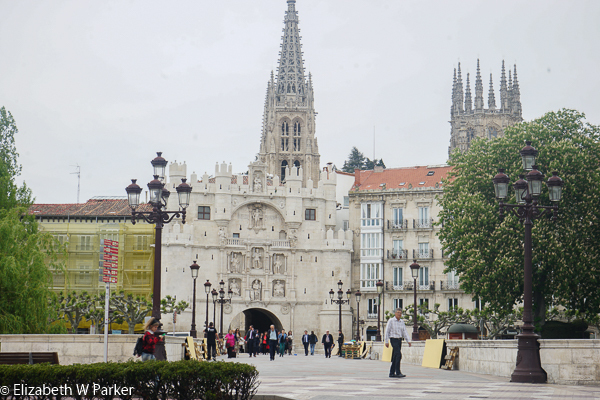 Once refreshed and more awake, we drove into Burgos, a matter of about 5 minutes. We found a parking lot just steps from the bridge that crosses the river to the Santa Maria Arch, the ceremonial entrance to the old city. 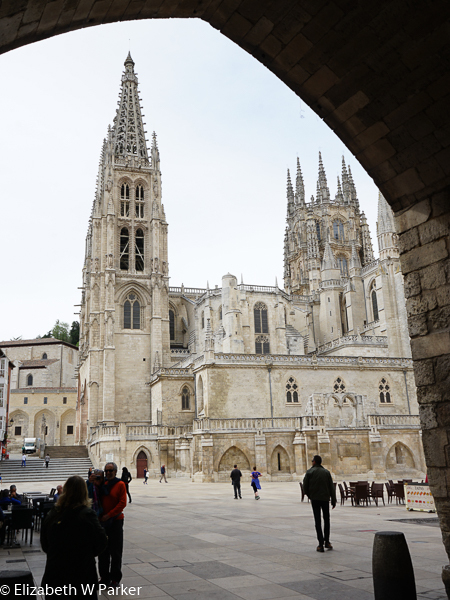 Our first and primary destination in Burgos was the Cathedral. It is immense! As I mentioned, it is the third largest in Spain after Toledo and Sevilla. Dutiful little acolytes of the Michelin Green Guide, we walked around the outside first. This walk gave us the full-impact of the building’s footprint, not only its size, but also the vertical changes. The area was excavated to make room for the cathedral nave and side aisles, which means that the streets go up and around the building. 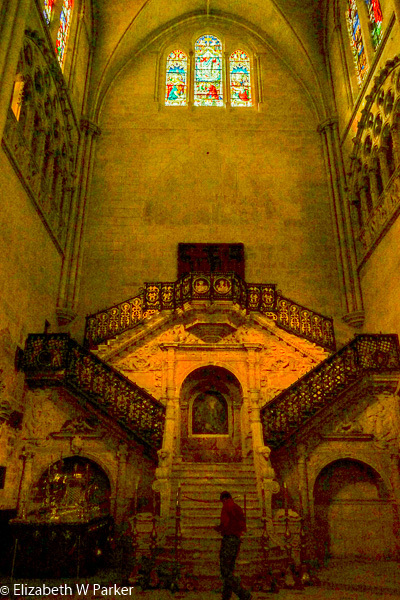 In fact, one of the doors of the cathedral (no longer in use) is at the street level from the outside, but accessible only from a large ornamental staircase from the inside! To see it at street level as we walked around put us on eye level with the Gothic saints flanking the entrance. And it is Gothic, as well as many other styles, but the Gothic style was still a fad in Spain when it was begun in the 13th century. 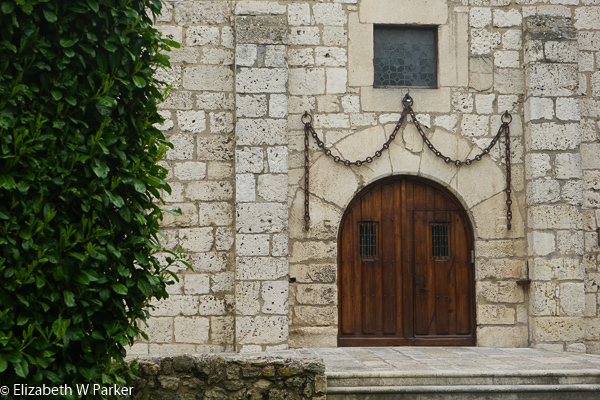 The style was waning in other parts of Europe but artisans skilled in its symbols and metaphors were moving southward and they helped to create the unique Spanish Gothic style using uniquely Spanish iconography. Unbelievably for me, a lover of the Gothic from way back, the architecture of the building was of only passing interest. The interior decoration is so outstanding that everything else became secondary. There are no major names in the history of art represented inside though there are many famous architects and especially sculptors responsible for the decoration. The choir is absolutely beautiful and the cupola in the central nave at the crossing of the transept is nothing short of breath-taking. The retable behind the main altar is noteworthy as are most of the altar decorations in the chapels. And like the Porta de la Coronería, the cloisters are remarkable for being on two levels, also, and for the same reason. Any guide book will take you through the various chapels. I cannot because a good portion of them were closed the day we were there. We were unable to visit the Capilla del Condestable, and the entire area behind the main alter (no reason given). 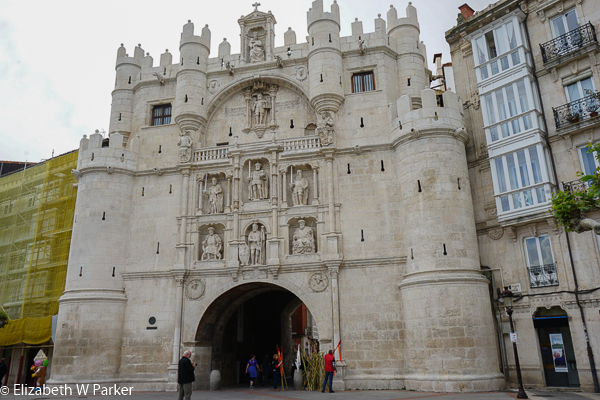 The Porta de la Pellejería was closed for restauration as was the Capilla del Santo Cristo (the one with the crucifix of human skin…). We missed another chapel because of a tour group occupying it. And some things have been moved in the last 15 years since our Green Guide was published – so we got to see one of the main chapels converted to a display of the treasures of the cathedral without having to wander in and out of various chapels to find them and view them in their original locations. This was a huge plus because they were beautifully displayed and lit, and very easy to admire from up close. 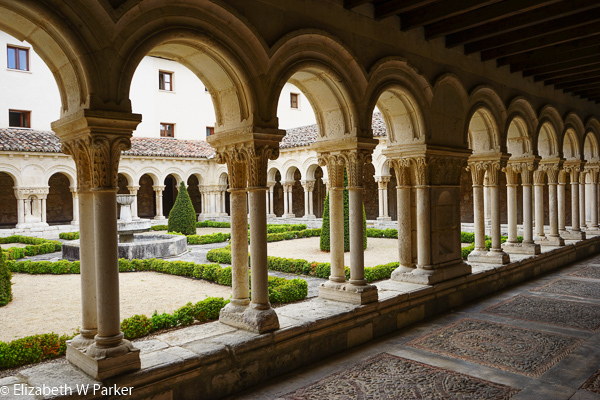 The cloisters are a wonderful short course on the religious decorative styles of the middle ages. Many of the arches have been restored to the way they once looked – but not all of them. This gives you the opportunity to examine the symmetry and beauty of the sculptural shapes (in those that have not been repainted) as well as the coloration and detailed painting of those where the polychromy has been restored. Polychromy is the art of painting with different colors. (Polychromy is the word our audio guide used. It was a new one for me but I looked it up and sure enough, it is an English word!) As it turns out we will see more of it in Burgos, and it is an important decorative technique for contemporaneous sculpture, too. 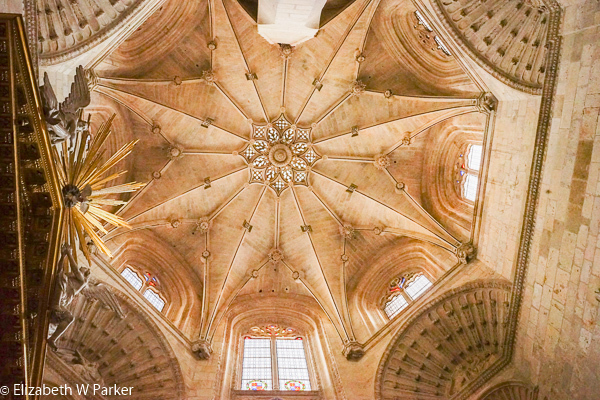 It would be easy for me to forget to mention that tomb of El Cid Campeador and his wife is in Cathedral. My excuse is that the presentation isn’t very impressive, just a metal plate in the floor. It is a big metal plate, right under the fabulous cupola, but it was also surrounded by people taking pictures so we didn’t get to examine it personally. I also have not read of the exploits of El Cid, except to know that they have been glorified and embellished in the retelling, creating a hero out of a soldier of fortune. Still, I will probably get to it before I return to Burgos. And, I must admit, as soon as I saw the cupola over the transept all coherent thought left my head! 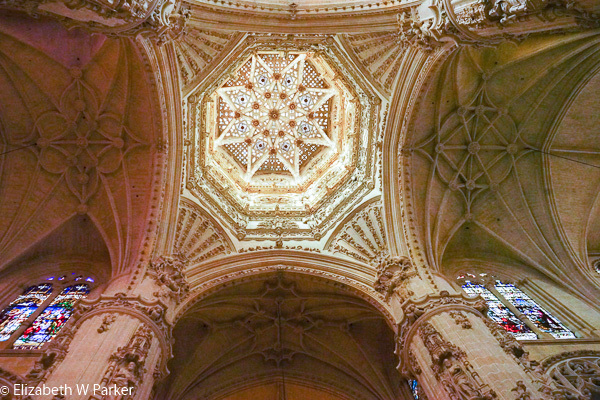 Please believe me, the Cathedral of Burgos is worth a trip. 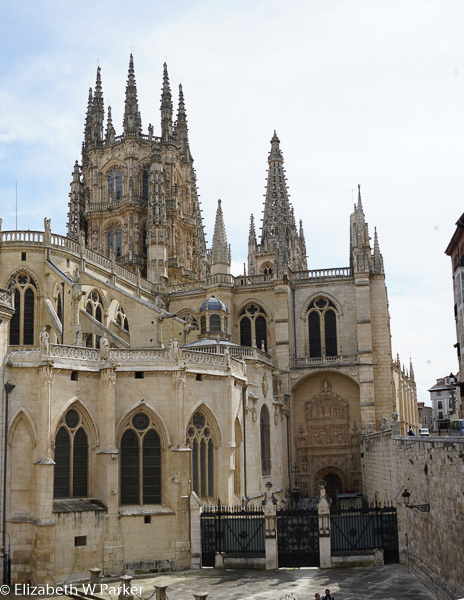 And, there is more to Burgos than just the Cathedral, and I hope that I will convince you by the end of my description! 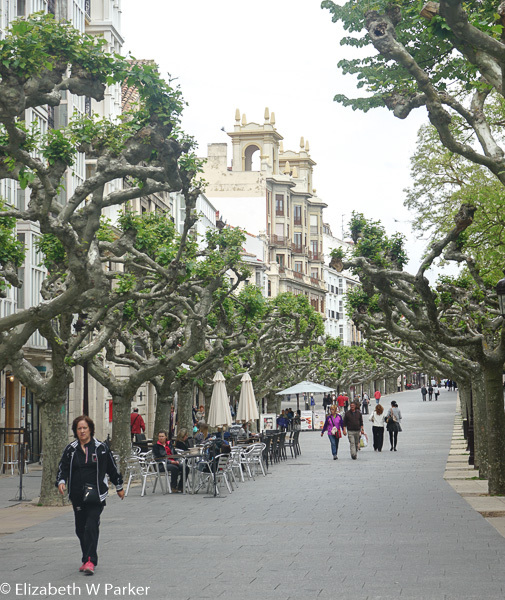 After the cathedral, we wandered down the Paseo del Espolón, a lovely pedestrian walkway flanking the river Arlanzón. The sky was black, though, and obviously bad weather was imminent! As we walked it began to rain (big, heavy drops) so we sought shelter and a beer and bathroom in a bar on the Plaza Mayor. 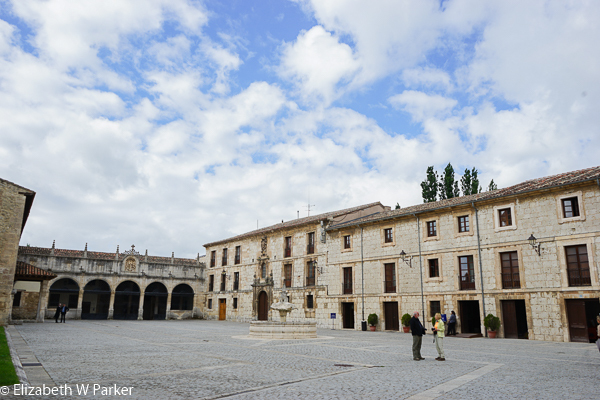 The Plaza Mayor may be “mayor” for Burgos, but it is really a very delightful shape, not quite round, not too big, surrounded by shops and bars all under a portico! Very cute. I wish we could have enjoyed it more by sitting under the trees or even in the plaza itself for our beers, but the rain was really coming down. Hoping that buying an umbrella would change our weather luck, we were disappointed and decided to return to the car. Our touring ended with a mad dash through the rain to the car, luckily parked underground, and an aborted trip to the castle ruins. Back at the hotel, we changed for dinner and had a good meal in the hotel restaurant. Following dinner, we explored the hotel a little more finding reading, game and conference rooms on the first floor. We also saw the most beautiful indoor swimming pool thanks to the efforts of a young woman at the front desk. And 9 hours later, we woke up! I don’t think I have ever slept so well the first night in Europe! What a great way to start another new day. We had breakfast in the hotel. [Have I mentioned how beautiful the hotel is?] For breakfast, we had three choices. 1) Eat standing at the bar. This was obviously what the locals do – there was quite a crowd. 2) Order room service. We are more the “get out and see people” type. 3) Sip our coffee and nibble croissants on the glassed-in porch. Perfect! We were pretty slow getting out of the hotel, but by 10:30 am we were on the road to the Abbey of Santa María la Real de las Huelgas. There is no parking within the monastery, but it isn’t a tourist site with thousands of visitors, so parking on the street outside was easy to find. The building complex is quite impressive. The massiveness of the late Romanesque period church dominates the view from the street. With our cloudy day, the feeling of being transported back to the Middle Ages was complete. The monastery can be viewed on an hour-long, guided tour. Our guide was excellent. He neither got too far in the weeds of the art and architecture, nor did he skimp on the heraldic symbols and noble lineages…It was the perfect combination of both. Sadly, no pictures are allowed inside so I will be sending you to other websites to see what it looks like. My first question, and perhaps yours too, was what does “las Huelgas” mean in this context. Una huelga in (at least Puerto Rican) Spanish is a labor strike. At first glance, there is nothing about that that seems to mesh with a monastery. 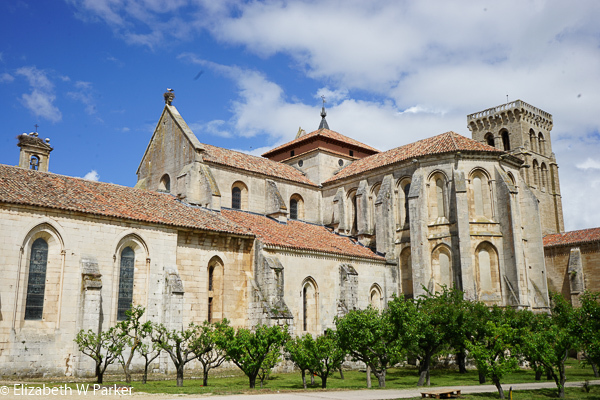 (My second question should have been why it was called a monastery and not a convent, because it was and always has been a convent for Cistercian nuns!) The guide explained about the “huelgas” and it is a fascinating look into why the word is appropriate for a labor strike! 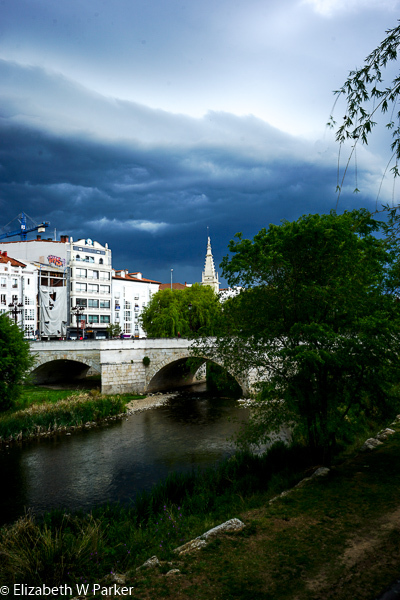 Although Burgos was never under Moorish control, during the Reconquista [the taking back of Spain from the Moors] land was divided up and designated for particular uses depending on its natural attributes. Forested land was set aside for hunting and trapping, as well as the harvesting of wood for construction. Arable land was set aside for farming and food production; arid land for vineyards. Land that wasn’t good for any of those was designated for grazing. Called los huelgos, it was basically unusable, unable to be worked by people, or “idle lands.” [Are you beginning to sense the meaning? Ie, a strike is when people don’t work?] In 1187, King Alfonso VIII and Queen Eleonor (of England), founded the monastery on land that wasn’t really good for anything. 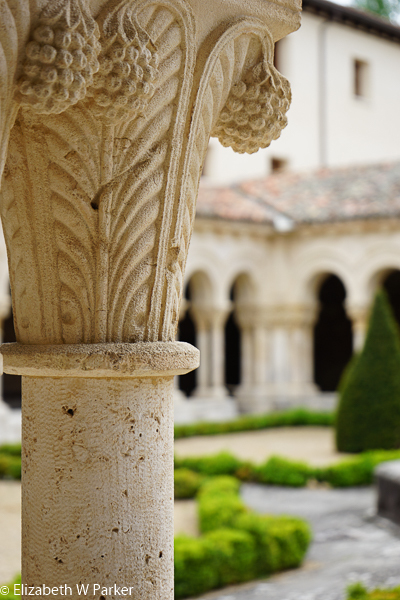 The capitals of the cloister columns are noteworthy for their artistry. The convent started out with about 20 nuns and within a generation there were more than 200 sisters in the convent. Though it was established as a daughter convent to one in Navarre, this convent became extremely powerful and all others in the area were under its dominion. Why? Because the nuns in this convent were all of noble, even royal, blood! The abbess was the civic authority as well as the religious authority for the 50 towns around the convent grounds. The convent church also became the burial place for the royal family. 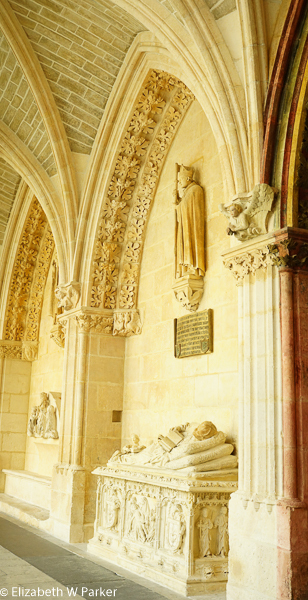 Even today, you can see the tombs of several generations of the family descended from Alfonso and Eleanor. Even more impressive than the tombs and sepulchers are the textile and clothing recovered from those that were not desecrated by the French in the 1800’s. The tombs were opened in the early 20th century and the fabrics restored. These are now part of a wonderful display of textiles of the Middle Ages, perhaps a unique exposition of garments and casket covers, in the Museum of Medieval Fabrics, part of the monastery. As with all powerful women, restraints needed to be applied! The convent church, which was not a parish church, but a church only for the nuns and the Royal families, was presided over by male clerics in the pay of the nuns. As if that were not enough control, a wall was also built sealing off the area where the nuns worshiped from the outsiders (the clerics and the royals). Through a screen, the nuns could hear and glimpse the mass. There is a curiously interesting pulpit installed close to the screen. 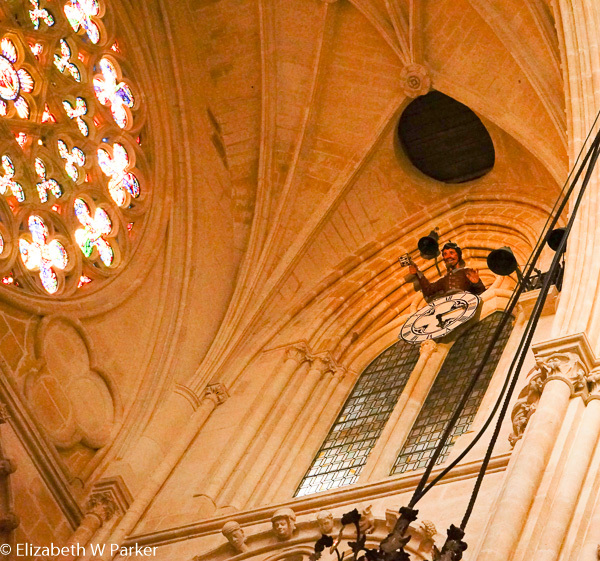 It could swing around to face the screen during the sermons, so the nuns could hear, and then swing back out of the visual line of sight to the altar where the priests performed the mass. 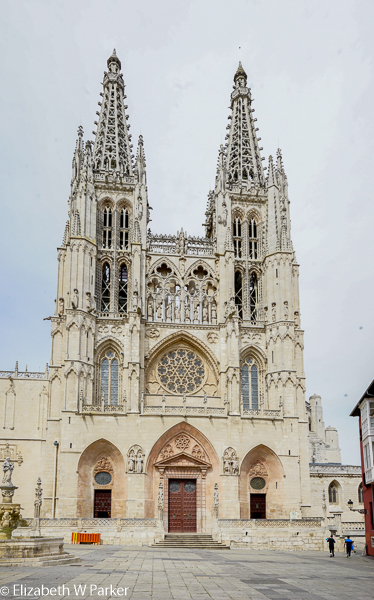 The choir, the area where the nuns sat during the mass, is not as elaborately decorated as that of the Cathedral in Burgos – and not anywhere near as elaborate as the choir for the male clerics right in their own church! 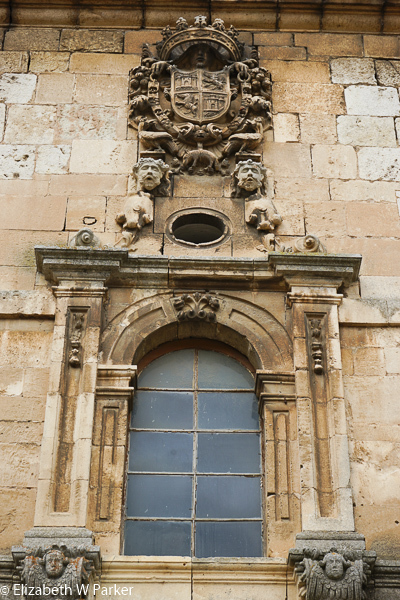 Nevertheless, it is quite elegant and includes carvings of the heraldry of the King and Queen. One of the many coats of arms we will see in Spain on this trip. Heraldic carvings dominate the decoration of the convent buildings, but there is also a strong Mudejar element in the decoration. Mudejar refers to the work of Muslim artisans for Christian buildings. It is interesting to see how the forms and styles of Islamic art are translated to Christian uses. Islamic decoration could not use human figures, so stylized Arabic letters and geometric shapes predominate. What is interesting about finding them here is, as I mentioned earlier, that this part of Spain was never under Moorish rule. In fact, the Mudejar artisans were imported from southern Spain because of the popularity of this type of decoration. Our guide mentioned how it was through the trade of portable items, like furniture and textiles, that the style became known and popularized in Northern Spain. If you love history, art history, textiles, design or the history of royal houses you will enjoy visiting this monastery. 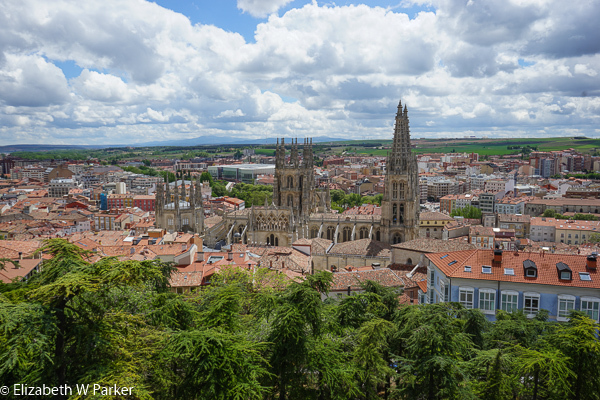 After the monastery, we made the effort to find the “castle ruins” from which there was a fantastic viewing place or “mirador” of the city of Burgos below. The size of the cathedral is clearly evident, and off in the distance we could see the convent of the morning’s visit as well. 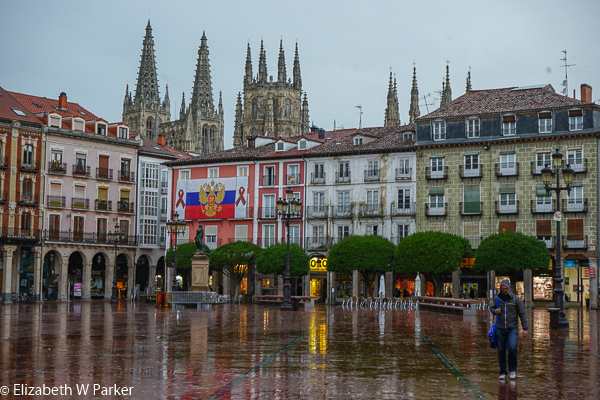 With sighs for a future return to Burgos, we headed out of the city and northward toward Donostia- San Sebastian, leaving Castilla y León for el País Vasco. To continue reading about this trip, please click here.